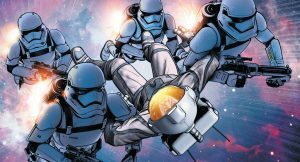 In Star Wars: Poe Dameron #25 Lor San Tekka is in desperate need of a rescue but writer Charles Soule starts off the issue with Lor recording what he thinks is his final message for the Resistance. But we all know that can’t be true since we’ve all seen The Force Awakens. However, Soule still manages to build tension within the story as Poe and the Black Squadron are in route to save him. Within a series of action-packed fight sequences between Tie-Fighters, X-Wings and jet pack flying Stormtroopers we delve deeper into the brilliant fighter pilot mind of Dameron and his creative vision on how to win a battle. Also, particularly interesting is the heartfelt way Soule can write for BB-8 and Ivee to make them express human emotion, love, and vulnerability. BB-8 is almost more expressive in this series of comics than he is in any of the movies. I’m not sure how much more we have to this story prior to the opening scene of Episode VII but things throughout this issue between not only humans but droids as well seem to be reaching their third act. Sacrifice and love are at the center of this issue even though most of it is action oriented. What comes across, in the end, seems to be Lor San Tekka’s final piece of philosophical wisdom and advice to Poe before they go their separate ways and the next time we’ll see them together is when they meet for the final time. Their relationship feels very similar to that of Luke and Obi-Wan. Soule is also effectively kicking off the Resistance unmasking the First Order for who they truly are and will rapidly soon become. I’ll be interested to see if Kylo Ren makes an appearance before all is said and done. On the surface, this issue looks like the final steps in Poe’s journey prior searching for Luke, and it very well may be, but there is so much more buried in the layers of Soule’s storytelling. Artist Angel Unzueta‘s work is also richly varied and full of detail. The battle in space is action packed but easy to follow and easy to get caught up in through Unzueta’s work. The work also translates well into the quality of work in each of the very recognizable characters that are rendered beautifully. There are some books in this Marvel line that could take note of how to illustrate a character’s face making them recognizable and familiar while still making it their own and not distracting from the story. How much deeper is Poe’s story is anyone’s guess but this issue would be a fitting conclusion to the overall story but I’m glad Soule still has some fuel in the tank to carry us a little further into Poe’s world. 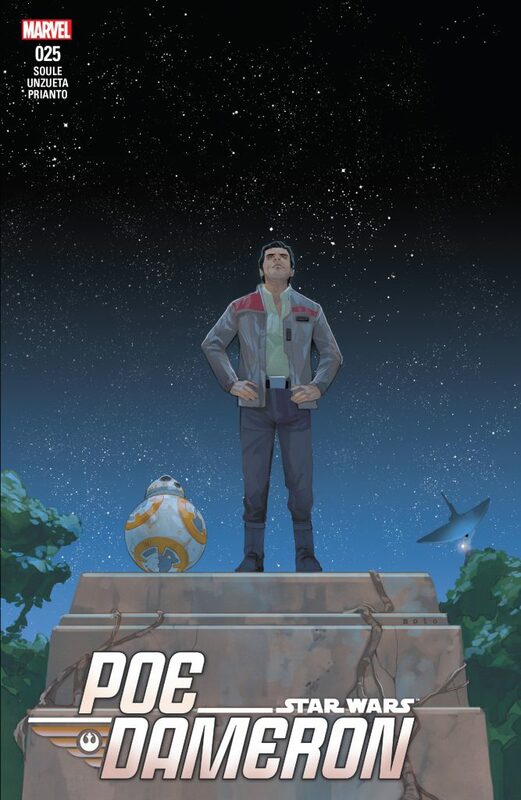 This series has been very good throughout it’s run and gives readers and fans more full-fledged version of Dameron and his relationship with Jess, Snap and the rest of his crew and General Organa and I am interested to see if this book can carry through The Force Awakens and beyond.